I was at the counter an hour after they opened the day of release after seeing it was sold out online! 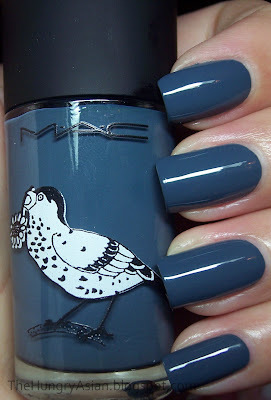 MAC polishes has always been love/hate for me, but this one is nothing but love. It was streaky the first coat, but a thin second coat made it perfect. I topped it with SV and I've been wearing this for 2 or 3 days now. No plans on taking it off until I see a major chip! I love the color, it's a dusty sort of greyed blue creme. Not the mention the cute packaging, I might have to go back and snag myself a lipstick or something. Franken - Water You Talking About Blue? Nicole by OPI It Gets Dark Early!